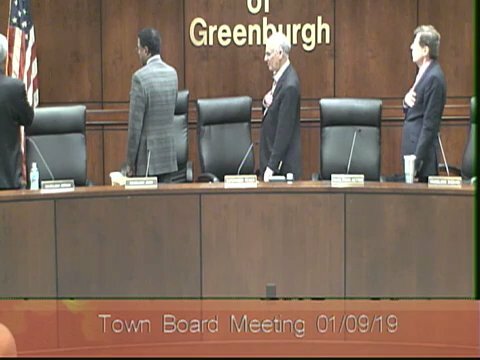 Meet Greenburgh's finest---why we did not appoint any new female police officers this past weekend..
Meet Greenburgh's finest--our new police officers who were sworn into office last night at our Town Board meeting. See video below. Swearing in of Entry-Level Police Officers (Peter A. Deluca, Justin M. Flynn, Paul N. Kandilou, Robert J. Martin and Vitaliy Tashentsev). We wish them great success and thank them for their anticipated service to our community. There is one problem: lack of female representation among the new officers hired. Our existing police headquarters has numerous problems. The time has come to seriously consider a new court house and police headquarters. Among the many problems we have with our existing facility: inadequate space for female officers. A former restroom was converted into a female locker room. The space is inadequate---making it difficult to hire another female officer at this point. In the coming months we will highlight the other problems we have with our existing headquarters. And, action steps we will take to increase the representation in the police department of more female officers. This will be given high priority in 2019. Independent architects that specialize in such facilities have advised that it is not feasible to expand the current building. I think most people would recommend we consider expanding before building a new facility, and the earlier feasibility studies we took said we would have to bulldoze both buildings and go up like the City of White Plains PD/Court. We are beginning a process that could lead to a new court house/police headquarters. We will keep you informed of the studies we plan to take, the review process that will happen and the public information meetings that will be scheduled.